Use sweet and juicy melons for this fresh and light starter in our late summer menu. For the salsa, place the peppercorns in a small bowl and add the salad onions. Juice both the limes and add to the bowl with the zest. Add the parsley, mint and sugar and mix together lightly. Halve the melon and discard the seeds. Cut each half in half again, then cut the flesh away from the skins using a small sharp knife. Cut into large chunks and divide between 6 serving plates. Flake the flesh of the trout fillets into bite-sized pieces using your hands. 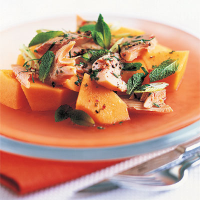 Scatter the fish over the melon pieces and serve with the herby salsa spooned over. Serve immediately with rye bread or grainy rolls, garnished with the reserved mint leaves. The salsa can be made 2-3 hours in advance, covered and chilled until needed. Add the mint just before serving to keep the fresh green colour. Lightly crush the peppercorns using a pestle and mortar, or place in a small bowl and use the rounded end of a rolling pin. Try the rest of this month's alfresco menu:Spice-crusted Chicken and Plum Crumble.